Judges on Virginia's highest court criticized the lack of transparency surrounding Democratic Gov. 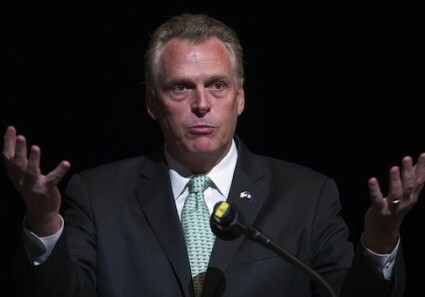 Terry McAuliffe's executive action to restore voting rights to 206,000 felons. The State Supreme Court held a hearing on Tuesday after Republican lawmakers sued to block the executive order, which they say is an unconstitutional overreach of power by the governor's office. Previous governors have issued restoration of voting rights on an individual basis. Justice William Mims took issue with the McAuliffe administration's refusal to release a list of all the felons included in the order, which has been requested by the press, state prosecutors, and the state legislature. "I, for one, do not understand how it is that a document of such importance can be shielded from the litigants and the citizens of Virginia," said Mims, according to the Richmond Times-Dispatch report. The administration has rejected freedom of information requests for the list of felons on grounds that it is an "executive working paper." It plans to continue classifying the list that way until it is fully uploaded to the state voter system, where it will remain confidential as a protected election paper. Mims said that the administration's secrecy around who was covered by the order helps the Republican litigants' argument that voters included in the lawsuit have standing to sue. Virginia law allows for eligible voters to challenge an individual's eligibility to be on the voter rolls, but that right is diminished if the names on the order remain a secret. "The governor’s failure to provide that public document may be the fulcrum on which standing turns," said Mims. Other justices on the court joined Mims in criticizing the lack of transparency. "Why can’t the list be made available to the citizens of Virginia and then let them exercise whatever rights they have?" asked Justice Arthur Kelsey. The lack of transparency has made it difficult for those concerned that individuals are improperly having their civil rights restored to act as watchdogs, but several mistakes have been uncovered nonetheless. Included on the list were several sexually violent predators who remain under state supervision and violent felons who remain in prison. Mistakes in the order are of particular concern to some because the restoration of civil rights for felons also opens the door for them to reacquire their right to own a gun.